Sprinkle eggplant slices lightly with salt. Let stand for about 1 hour and pat dry with paper towels. Coat evenly with flour, shaking off excess. Heat 1/3 cup of oil in a large skillet over medium high heat. 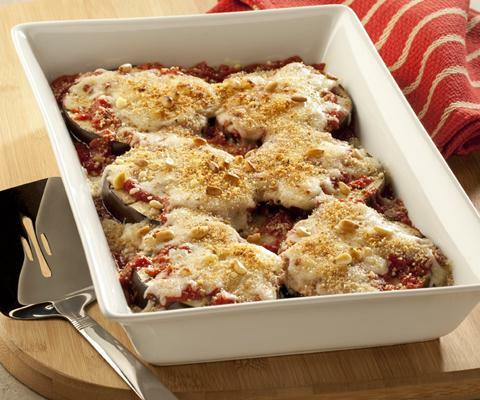 Add 2 to 3 eggplant slices at a time and cook for about 2 minutes on each side, or until golden brown. Repeat with remaining eggplant slices, adding more oil as needed. Preheat oven 350°F. Lightly coat 11x8 baking dish with nonstick cooking spray. Spoon 1 cup of Pasta Sauce evenly over the bottom of baking dish. Layer with 1/3 of eggplant, 1/3 of remaining Pasta Sauce, 1/3 of mozzarella cheese and 1/3 of Parmesan cheese. Repeat layers twice. Bake uncovered for about 25 to 30 minutes, or until hot and bubbly. Allow to rest for 5 to 10 minutes before serving. Serve with additional grated Parmesan cheese if desired. Could not recommend this dish with the salt used to "bleed" the eggplant. I could not eat it even though I drained and patted (pressed hard)to rid the eggplant of the salt and water. A lot of work prepping but the end result is well worth it. I used the Tomato, Basil and Garlic sauce. I also added a liberal amount of red pepper flakes. Would definitely make this again.